Former two-time world champion James DeGale and former world title challenger Chris Eubank Jr. both weighed-in within the 168-pound limit for their 12-round super middleweight clash that headlines a SHOWTIME CHAMPIONSHIP BOXING doubleheader tomorrow/Saturday live on SHOWTIME (3:45 p.m. ET/12:45 p.m. PT) from The O2 in London. 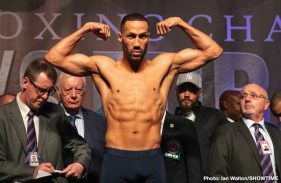 DeGale (25-2-1, 15 KOs) measured 166 pounds while his fierce rival tipped the scales at 167 pounds for their all-British grudge match. 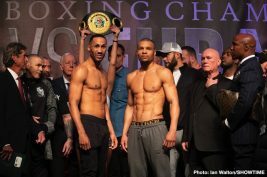 At stake for both men in the long-awaited showdown are British bragging rights, but more importantly a chance for another world title shot in the deep super middleweight division. 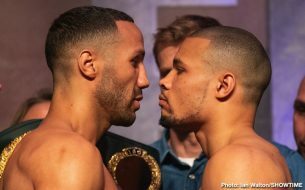 Eubank Jr., the son of British legend and former two-division champion Chris Eubank Sr., has faced champions George Groves and Arthur Abraham and is now seeking a signature win against DeGale, the first British boxer to win an Olympic gold medal and a world championship. 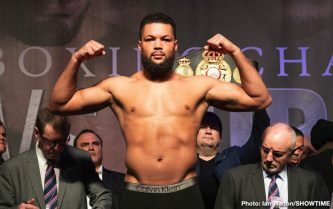 Undefeated heavyweight Joe Joyce has knocked out all seven of his professional opponents but will face the toughest test of his professional career in Bermane Stiverne, a former WBC Heavyweight World Champion and the first fighter to push reigning champion Deontay Wilder the distance. 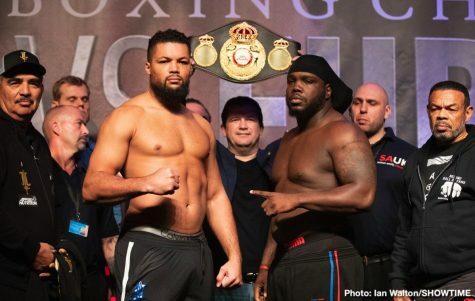 The 2016 Olympic Silver Medalist Joyce (7-0, 7 KOs) measured 265 pounds while Stiverne tipped the scales at a career-high 273 pounds for their 12-round bout for the British Commonwealth Heavyweight Championship. 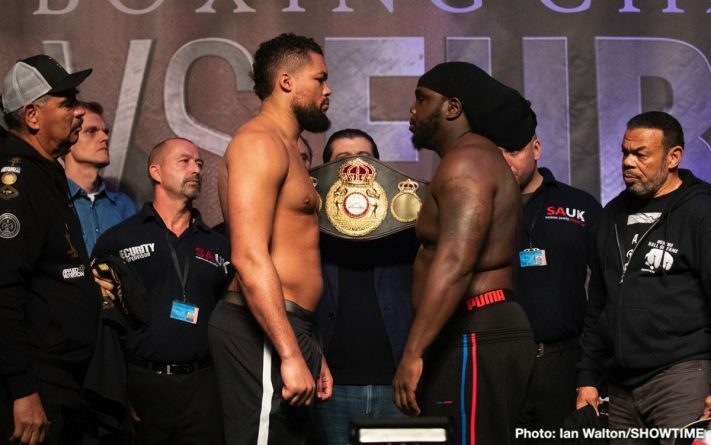 Stiverne (25-3-1, 21 KOs) is looking to bounce back from a one-sided defeat to Wilder in a 2017 rematch and prove that he’s still a threat in the deep and vibrant heavyweight division. Veteran broadcaster Brian Custer will host the doubleheader from London with versatile combat sportscaster Mauro Ranallo calling the action ringside alongside Hall of Fame analyst Al Bernstein. Three Hall of Famers will round out the telecast team – Emmy® award winning reporter Jim Gray, boxing historian Steve Farhood as unofficial ringside scorer, and world-renowned ring announcer Jimmy Lennon Jr. 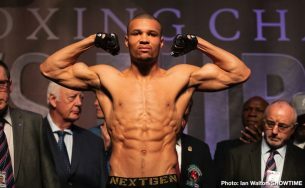 Note: Former featherweight world champion Lee Selby and Omar Douglas will fight in a 12-round lightweight swing bout. 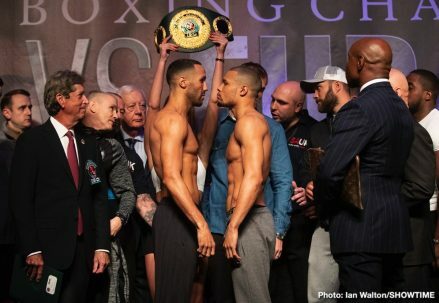 Selby measured 134 ½ pounds for his lightweight debut while Douglas weighed-in at 132 pounds. 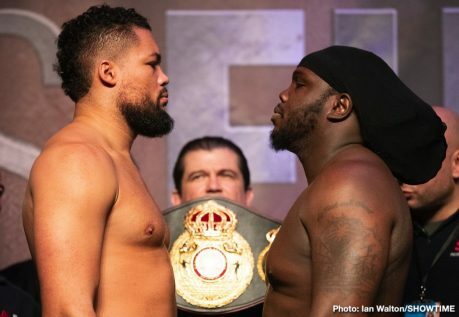 In the co-featured bout of the SHOWTIME CHAMPIONSHIP BOXING® telecast,, fast rising prospect Joe Joyce (7-0, 7 KOs) battles former world champion Bermane Stiverne (25-3-1, 21 KOs) in a 12-round heavyweight clash. The event is promoted by Poxon Sports and presented by Premier Boxing Champions. 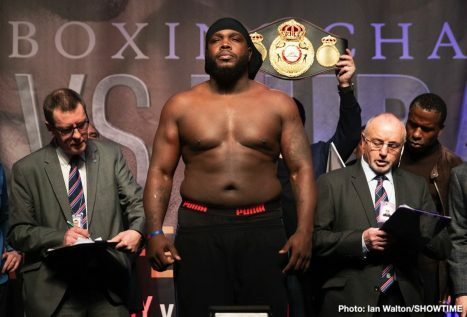 Joyce-Stiverne is promoted in association with Ringstar Sports and Don King Productions. The doubleheader will air live in the U.S. exclusively on SHOWTIME and on ITV Box Office in the U.K.
“Come February 23rd the smile will be wiped off his face. He’s all show. If I’m honest, if his surname was Smith, you wouldn’t know who he was. He’s riding off his dad’s name. 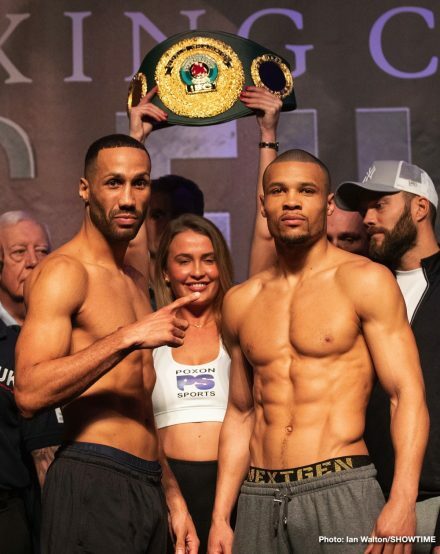 There are levels in boxing and I’m on a level above him. Come fight night, it’s going to be a schooling. 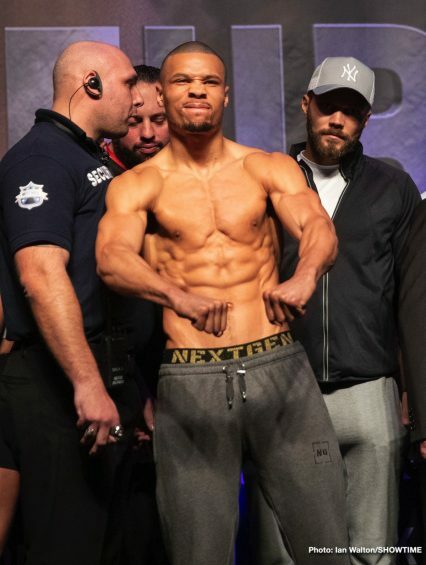 Eubank Jr is gonna get schooled. I’ve dubbed this a ‘retirement’ fight. When he loses, he’s finished, he’s done. This will be his last fight. “I’m so excited about this fight. I’ve been training for a long time and I’m feeling great, feeling focused and ready to do battle. The last couple of years, injury wise, have been very frustrating for me. But now, I can honestly say that I’m feeling great. I’m going to put in a fantastic performance against Chris. 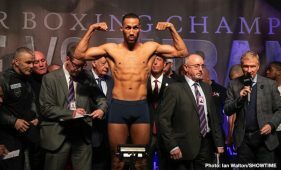 Come February 23rd it’s going to be a fantastic night and a fantastic victory for me. “I’m a London boy through and through. I was raised in Harlesden and I’m proud of my city, proud of where I’m from. 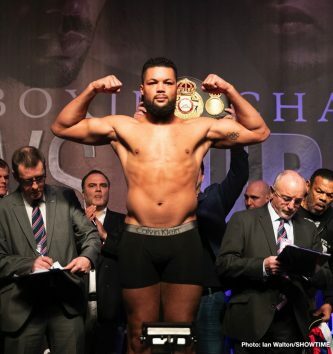 So, it will be good to go back to The O2 and put on a fantastic performance for the fans. I can’t wait. “It’s been a successful and enjoyable career for most of the time. I’ve lived the dream and done everything in boxing but sometimes it feels like I don’t get the credit I deserve. “He’s the type of fighter who rises to the occasion. If he’s got someone he doesn’t respect or fear, then that shows in his performance. He respects me and knows what is coming, so he is going to be on form. “He’s had some hard fights, that’s for sure. It is one of those things – a fight like this especially against me – could be career ending. “I’m relentless, I don’t stop. Volume, speed, power, it is all a dangerous combination, and he knows that. “I had a Bentley last year and the McLaren this year. I guess I just needed something faster this time around. I always said I would learn how to try one of giant trucks my dad drove but, for now, a sports car is more my style.